Eco-Cup and Eco-Server„ San-Ai Corporation, U.S.A. 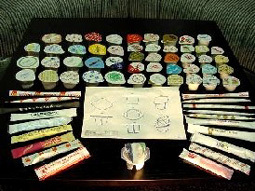 The photo's above are just a small sample of the numerous designs of disposable cups, stir sticks and condiment packages, just for a typical Fast Food Coffee Beverage. 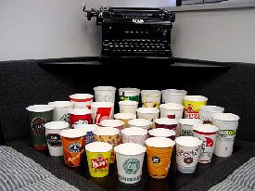 As you can see, many of these cups require multiple stir sticks, plastic film packaging and other redundant forms of paper and petrochemical products. 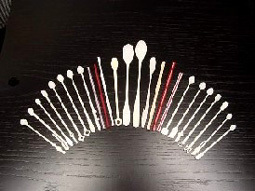 Our patented Eco-Cup combines the convenience of the Stir-Stick into the existing Coffee Cup. And our Eco-Server combines the convenience of the Sweetener and the Cream into one package, immediately eliminating 50% of the waste associated with the current serving systems available on the international fast food packaging market. As mentioned previously, our emphasis on Environmentally Friendly products remains a high priority in our design and research development projects. San-Ai Corporation looks forward to the opportunity to present the complete San-Ai ECO-SERVE Family of products for your existing condiment packaging needs. 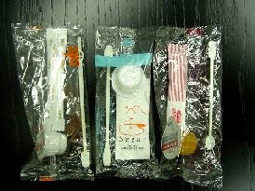 For example, each of these Fast Food items is presently supported by traditional Industry Standard condiment packaging.